Marine Corps Air Station Miramar (MCAS Miramar) (IATA: NKX, ICAO: KNKX, FAA LID: NKX), formerly Naval Auxiliary Air Station (NAAS) Miramar and Naval Air Station (NAS) Miramar, is a United States Marine Corps installation that is home to the 3rd Marine Aircraft Wing, which is the aviation element of the 1st Marine Expeditionary Force. It is located in Miramar, San Diego, California, about 10 miles (16 km) north of Downtown San Diego. The airfield is named Mitscher Field after Admiral M.A. Mitscher who was the commander of Task Force 58 during World War II. The air station is the former location of Pacific Fleet fighter and Airborne Early Warning and Control aircraft (F-4 Phantom II, F-14 Tomcat, E-2 Hawkeye) and is best known as the former location of the United States Navy Fighter Weapons School (NFWS), its TOPGUN training program and the movie of the same name. In 1996, NFWS was relocated to Naval Air Station Fallon in western Nevada and merged into the Naval Strike and Air Warfare Center (NSAWC). During the heyday of TOPGUN at NAS Miramar, the station was nicknamed "Fightertown USA". The base contains 23,116 acres (93.55 km2). It is bisected by Kearny Villa Road and Interstate 15. The area east of Kearny Villa Road, called "East Miramar", is undeveloped and is used for military training. Kumeyaay Native Americans were the first inhabitants in the vicinity of the base. Spain claimed the San Diego area in 1542 and colonized it beginning in 1769. In 1846 the crown issued a land grant that included the area of the current base to Don Santiago Argüello. After the American Civil War, the land was divided and sold to people such as Edward Scripps, a newspaper publisher from the eastern United States, who developed a ranch on the site. It was Scripps who named the area Miramar, meaning "view of the sea". The land was predominantly used for grazing and farming into the early 20th century. During World War I, the U.S. Army acquired 12,721 acres (5,148 ha) of land in the Miramar Ranch area, on a mesa north of San Diego. Camp Kearny was opened on 18 January 1917 and was named after Stephen W. Kearny, who was commander of the Army of the West during the Mexican–American War. The base was primarily used to train infantrymen on their way to the battlefields of Europe. During World War I an airstrip was never built on the property, although Army and Navy aircraft from Naval Air Station North Island did land on the parade deck. Following the Armistice, the base was used to demobilize servicemen and was closed on 20 October 1920. More than 1,200 buildings were demolished when the camp closed. Charles Lindbergh's Spirit of St. Louis airplane was built in nearby San Diego. Lindbergh used the abandoned Camp Kearny parade field to practice landings and take-offs before making his historic solo flight across the Atlantic Ocean. During the 1930s, the Navy briefly used the air base for helium dirigibles. In 1932 a mooring mast and hangar were built at the camp for the dirigibles, but when the program was abandoned, the base was quiet again. By the time World War II began, Miramar was already undergoing a “precautionary” renovation. Camp Holcomb (later renamed Camp Elliott) was built on part of old Camp Kearny, to be used for Marine artillery and machine gun training. 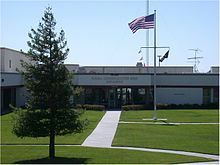 Camp Elliott became home to Fleet Marine Force Training Center, West Coast and the 2nd Marine Division, charged with defending the California coast. Runways were constructed in 1940, and the 1st Marine Air Wing arrived on December 21 of that year. The Navy commissioned Naval Auxiliary Air Station (NAAS) Camp Kearny in February 1943, specifically to train crews for the Consolidated PB4Y-2 Privateer, which was built less than 10 miles (16 km) away in San Diego. A month later, the Marines established Marine Corps Air Depot Camp Kearny, later renamed Marine Corps Air Depot Miramar, to avoid confusion with the Navy facility. The big Privateers proved too heavy for the asphalt concrete runway the Army had installed in 1936 and the longer runways built in 1940, so the Navy added two concrete runways in 1943. During the 1940s, both the Navy and the Marine Corps occupied Miramar. East Miramar (Camp Elliott) was used to train Marine artillery and armored personnel, while Navy and Marine Corps pilots trained on the western side. The bases were combined and designated Marine Corps Air Station Miramar in 1946. In 1947, the Marines moved to MCAS El Toro in Orange County, California, and Miramar was redesignated as NAAS Miramar (Naval Auxiliary Air Station Miramar). It became NAS Miramar (Naval Air Station Miramar) on 1 March 1952. In 1954, the Navy offered NAS Miramar to San Diego for $1 and the city considered using the base to relocate its airport. But it was deemed at the time to be too far away from most residents and the offer was declined. Only the western half of Miramar’s facilities were put to use, and the old station literally began to deteriorate, with many buildings sold as scrap. Miramar found new life as a Navy Master Jet Station in the 1950s. The eastern half, former Camp Elliot, was used by the United States Air Force for Project Orion (having been transferred temporarily), and later by NASA; it was the site of several launches. The base really came into its own during the Vietnam War. The Navy needed a school to train pilots in dog-fighting and in fleet air defense. In 1969 the United States Navy Fighter Weapons School was established organizationally as part of VF-121, which was then the F-4 Phantom Fleet Replacement Aviation Maintenance Personnel (FRAMP), which trained the maintainers who joined the fleet as qualified "Phantom Phixer's"
In October 1972, Miramar welcomed the F-14 Tomcat and fighter squadron VF-124, a former Fleet Replacement Squadron (FRS) tasked with the mission to train new Tomcat crews. Formerly, VF-124 had been training pilots in the F-8 Crusader. That task was handed over to Light Photographic Squadron 63 (VFP-63) that then became "Crusader College" The first two operational Tomcat squadrons, VF-1 known as the "Wolfpack" and VF-2 known as the "Bounty Hunters," trained here before deploying aboard USS Enterprise (CVN-65) in 1974. In 1993, the Base Realignment and Closure Commission recommended that Marine Corps Air Station El Toro and Marine Corps Air Station Tustin be closed down and that NAS Miramar be transferred to the Marine Corps. BRAC also recommended that all Navy Pacific Fleet F-14 aircraft and squadrons (with the exception of those assigned to Carrier Air Wing 5 in Japan) and Pacific Fleet F-14 training be consolidated with the Atlantic Fleet and be relocated to NAS Oceana, Virginia. BRAC recommended that Pacific Fleet E-2C training be consolidated with Atlantic Fleet E-2C training at Naval Station Norfolk, Virginia, that all Pacific Fleet E-2C aircraft and squadrons (with the exception of those assigned to Carrier Air Wing 5 in Japan) be relocated to NAS Point Mugu, California and that the Naval Fighter Weapons School (TOPGUN) and Navy Reserve adversary squadron VFC-13 be relocated to NAS Fallon, Nevada. In 1999, MCAS El Toro and MCAS Tustin were closed and the 3rd Marine Aircraft Wing returned to Miramar when it officially became Marine Corps Air Station Miramar. On October 1, 1997, Colonel Thomas A. Caughlan became the first Marine commanding officer of MCAS Miramar since World War II. Caughlan was also the last commanding officer of MCAS Tustin. In 2005, the BRAC Commission directed instructor pilots and support personnel from Miramar to Eglin AFB in Florida, sufficient to stand up the Marine Corps' portion of the F-35 Lightning II Joint Strike Fighter Program (JSF) Training Site. This will lead to an eventual phasing out of Fighter Pilot training at Miramar by 2015 as the F-18s are retired. 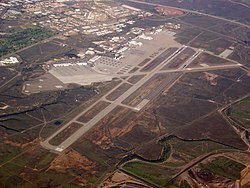 In 2006, the San Diego County Proposition A proposed obtaining 3000 acres (12 km²) at MCAS Miramar to develop a commercial airport. The proposition was defeated 62 percent opposed to 38 percent in favor. To lessen the noise impact to the community, MCAS Miramar has made adjustments to their operations over the years, including the use of hush-houses, limitations on engine run-ups, and modification to flight plans. On 4 December 1959, an F3H Demon with Navy pilot ENS Albert Joe Hickman crashed into the adjoining community of Clairemont Mesa. The pilot stayed with the aircraft to avoid hitting a school. The city named an elementary school in Mira Mesa after him. On 12 August 1968, a U.S. Navy Vought F-8 Crusader (F-8C) fighter jet of VF-124 crashed while returning to (then) NAS Miramar, from nighttime Sidewinder missile training with 3 other F-8 Crusader fighters. The pilot, LT (JG) Roman S. Ohnemus, 25, did not eject, and died in the crash. The incident occurred in the dark, early morning hours in remote, brush-covered terrain (somewhat level except for narrow valleys), north of (then) NAS Miramar, and Miramar Road, west of U.S. Highway 395 (now Interstate 15), and south of Black Mountain. A small brush fire was started by the crash. Live missiles presented a dangerous crash site to the first-arriving state forestry firefighters, who were woken by the crash. They were from the nearby (between 1 and 2 miles) Miramar California Division of Forestry (now CalFire) fire station. On 22 December 1969, an F-8J Crusader of VF-194 crashed into a hangar at NAS Miramar, after the pilot ejected. 14 died and 30 were injured. Pilot Lt. C. M. Riddell ejected safely. Five other fighters, including two F-4s, were damaged in the repair facility fire that ensued. Helicopters and military and civilian ambulances were used to transport the injured to Balboa Naval Hospital, San Diego. On 27 March 1978, an F-14 Tomcat from VF-1 crashed into I-15 just short of the runway and was stopped on the northbound lanes by a concrete divider. One aviator in the Tomcat was killed. On 7 November 1978, an A-4 Skyhawk used by the Navy Flight Demonstration Squadron, the Blue Angels, crashed and the pilot was killed. On 11 March 1985, an F-8 Crusader crashed into a parking lot of a nearby industrial park. The pilot ejected safely. On 26 June 1987, an A-3 Skywarrior from VQ-1 was practicing night Field Carrier Landing Practice (FCLP) - The aircraft impacted the ground after turning downwind subsequent to take off. Three crewmembers were killed. On 11 March 2004, a UC-35 crashed on east Miramar at the approach end of the runway. 4 Marines were killed. In November 2006, an F/A-18C Hornet crashed on the eastern perimeter of the base, with the pilot ejecting safely. On 8 December 2008, four people were killed, two homes were destroyed and three homes were damaged when an F/A-18D Hornet crashed about 2 miles (3.2 km) from the base. The plane was returning from training exercises with the USS Abraham Lincoln, which was off the coast of San Diego. The pilot was attempting to steer the aircraft to an unpopulated area when he lost all engine, electrical and hydraulic power. He ejected safely. On 30 January 2010, the Department of Veterans Affairs dedicated a new National Cemetery at the northwest corner of MCAS Miramar. The cemetery is an extension of Fort Rosecrans National Cemetery and when complete will accommodate approximately 235,000 deceased veterans and spouses. MCAS Miramar is home to the Flying Leatherneck Aviation Museum, which is open to the public. The Miramar Airshow is a major airshow held at MCAS Miramar each September. Pogogyne abramsii – an endangered plant found on the grounds of MCAS Miramar. San Diego International Airport is another airport located in San Diego. ^ Perry, Tony (June 1, 1996). "San Diego bids farewell to Top Guns". Eugene Register-Guard. Oregon. (Los Angeles Times). p. 3A. ^ Fordahl, Matthew (May 28, 1996). "'Top Gun' flight school is leaving San Diego". Free Lance-Star. Fredericksburg, Virginia. Associated Press. p. C7. ^ Shettle Jr., M L (2001). United States Marine Corps Air Stations of World War II. Bowersville, Georgia: Schaertel Publishing Company. p. 103. ISBN 0-9643388-2-3. ^ United States Naval Aviation 1910–1995 (PDF). Naval Historical Center. Archived from the original (PDF) on April 10, 2010. Retrieved September 10, 2009. ^ Linder, Bruce (2001). San Diego's Navy. Annapolis, Maryland: Naval Institute Press. p. 126. ISBN 1-55750-531-4. ^ Shettle Jr., M L (2001). United States Marine Corps Air Stations of World War II. Bowersville, Georgia: Schaertel Publishing Company. p. 105. ISBN 0-9643388-2-3. ^ "Camp Elliot". Camp La Jolla Military Park. University of California, San Diego. Retrieved 13 January 2011. ^ "Overview of Marine Corps Air Station Miramar". MilitaryHOMEFRONT. Archived from the original on 7 July 2012. Retrieved 13 January 2011. ^ "2.0 MCAS MIRAMAR LAND USE" (PDF). MCAS Miramar, California. United States Marine Corps. Archived from the original (PDF) on 22 July 2011. Retrieved 13 January 2011. ^ "Atlas ICBM Missile". amp La Jolla Military Park. University of California, San Diego. Retrieved 13 January 2011. ^ Shettle Jr., M L (2001). United States Marine Corps Air Stations of World War II. Bowersville, Georgia: Schaertel Publishing Company. ISBN 0-9643388-2-3. ^ "Miramar's first Marine commander since WWII retires". Marine Corps News. United States Marine Corps. ^ "May 2005 Base Closure and Realignment Report" (PDF). DefenseLink.mil. ^ Ristine, Jeff (December 11, 2006). "Vigorous 'no' for Miramar airport – Every city in county rejected proposition". San Diego Union-Tribune. Archived from the original on July 1, 2007. ^ "MCAS Miramar Today: Community Relations". No on Prop A. Retrieved 2008-08-20. ^ "MCAS Miramar Noise Complaint hotline". MCAS Miramar. Archived from the original on 2008-03-13. Retrieved 2008-08-18. ^ "Hickman the Hero". Retrieved 20 June 2016. 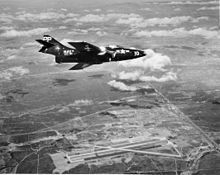 ^ Miramar Naval Air Station, CA Jet Fighter Crashes Into Hangar, Dec 1969 | GenDisasters ... Genealogy in Tragedy, Disasters, Fires, Floods. .gendisasters.com. Retrieved on 2014-05-24. ^ Redlands, California: Redlands Daily Facts, Thursday, 22 December 1969, page one. ^ This Is A Work In Progress And I Archived 2012-10-02 at the Wayback Machine. Ejection-history.org.uk. Retrieved on 2014-05-24. ^ In 1982, I-15 was relocated eastward, and the road where the crash occurred became an extension of Kearny Villa Road. See Cooper, Casey (February 1, 2008). "Unmarked Freeways: Kearny Villa Road". Historical Highways of Central and Southern California. ^ "Welcome blueangels-usn.org - Hostmonster.com". Archived from the original on 14 June 2016. Retrieved 20 June 2016. ^ This Is A Work In Progress And I Archived 2012-10-11 at the Wayback Machine. Ejection-history.org.uk. Retrieved on 2014-05-24. ^ . http://www.a3skywarrior.com/personnel/memorials/a-3-accidents-by-buno.html. Retrieved on 2015-11-26. ^ a b "Records sought on jet type involved in crash". MSNBC. Associated Press. December 9, 2008. Retrieved December 9, 2008. ^ Moss, Andrea (30 January 2010). "MIRAMAR: Veterans, officials dedicate new national cemetery at Marine Corps air base". San Diego Union-Tribune. Archived from the original on 6 September 2011. Retrieved 2015-05-13. O'Hara, Thomas (2005). Images of America – Marine Corps Air Station Miramar. Charleston, SC: Arcadia. ISBN 0-7385-3058-1. Shettle, M. L. (2001). United States Marine Corps Air Stations of World War II. Bowersville, Georgia: Schaertel Publishing Company. ISBN 0-9643388-2-3. Wikimedia Commons has media related to Marine Corps Air Station Miramar.